Indian desserts, are such a treat!! 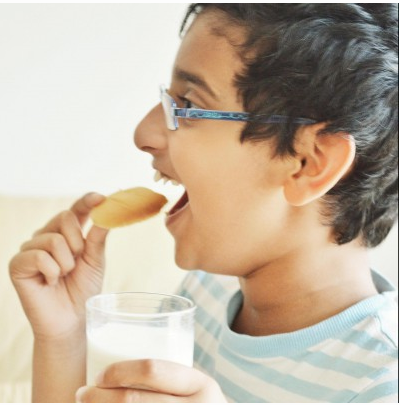 Rasmalai, Rasgolla, Kheer, Gulab Jamun and Gajar/Carrot Halwa are few of the popular ones from among the huuuuuge list of delicious desserts. Nt heard of carrot halwa before? No worries! I’ll tell you what it is. It. A popular north Indian/Pakistani dessert made with grated carrots, whole milk, mawa, dried fruit, and nuts, and it has a delicious light fudgey texture to it. It is also known as gajrela. To prepare this, the carrots are slowly cooked in lots of milk and sugar until milk has reduced to about one-third of it’s original quantity or till you get a rabdi. I used sweetened condensed milk here. If you use condensed milk you can reduce the amount of milk and so you don’t have to cook for long. But i did it the traditonal way, by using lots of milk plus condensed milk and cooked it on low for an hour. And it tasted divine, melts in the mouth. 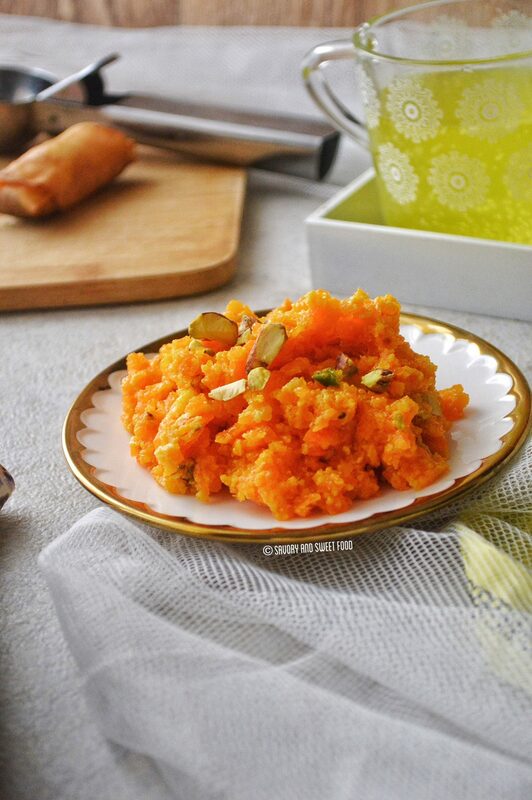 I was craving some classic indian dessert, so I made Carrot Halwa, but…. with a twist! 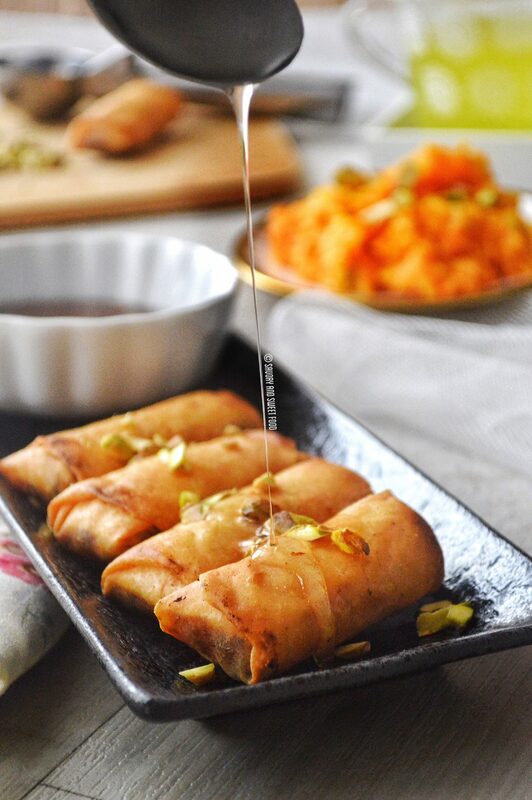 So that i could share a new way to eat this dessert with you all in the form of this handy, bite size carrot halwa spring rolls. 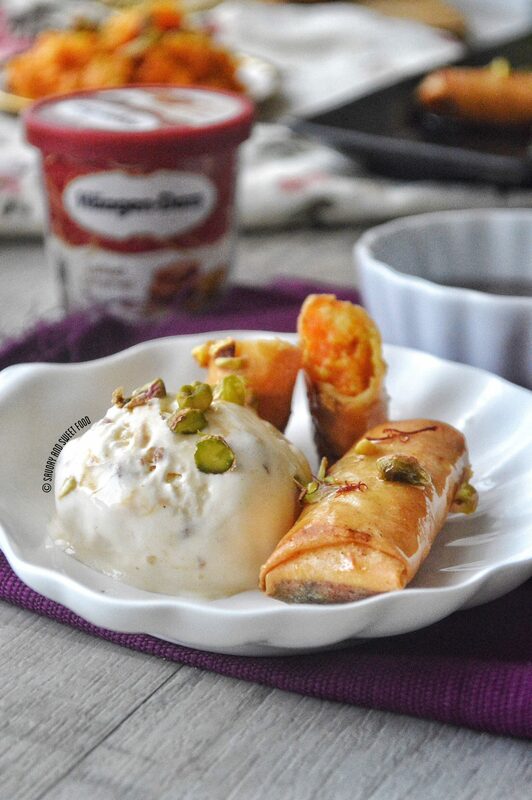 Drench the hot spring rolls in a thick fragrant sugar syrup and serve it warm with your favorite icecream. 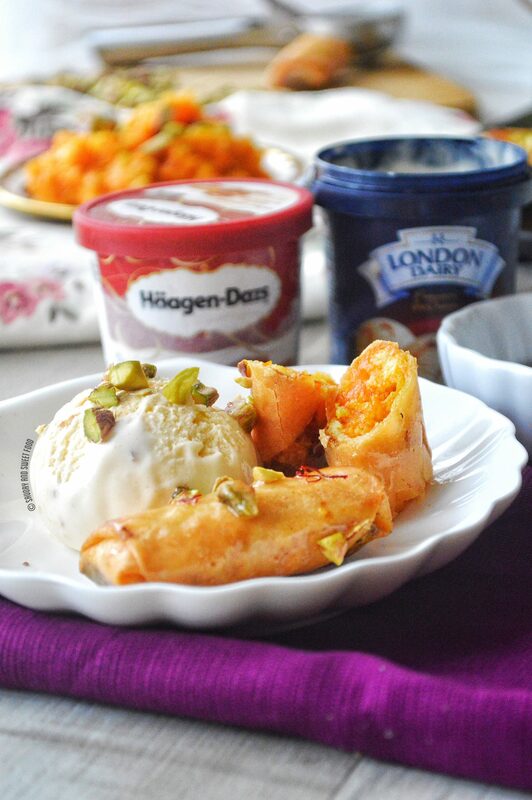 Perfect dessert to have during the winters. Put on your sweater, pull up your socks and cuddle in your couch with this dessert and enjoy. ✔️ As i was too lazy to grate the carrots, i chopped mine really fine in the food processor and it came out really good. ✔️ If you don’t want to cook for so long and need a faster gajar halwa, reduce the amount of milk to about half a cup. But i highly recommend long slow cooking. ✔️ You can omit the condensed milk amd just add sugar. ✔️ Drench the spring roll completely in sugar syrup. 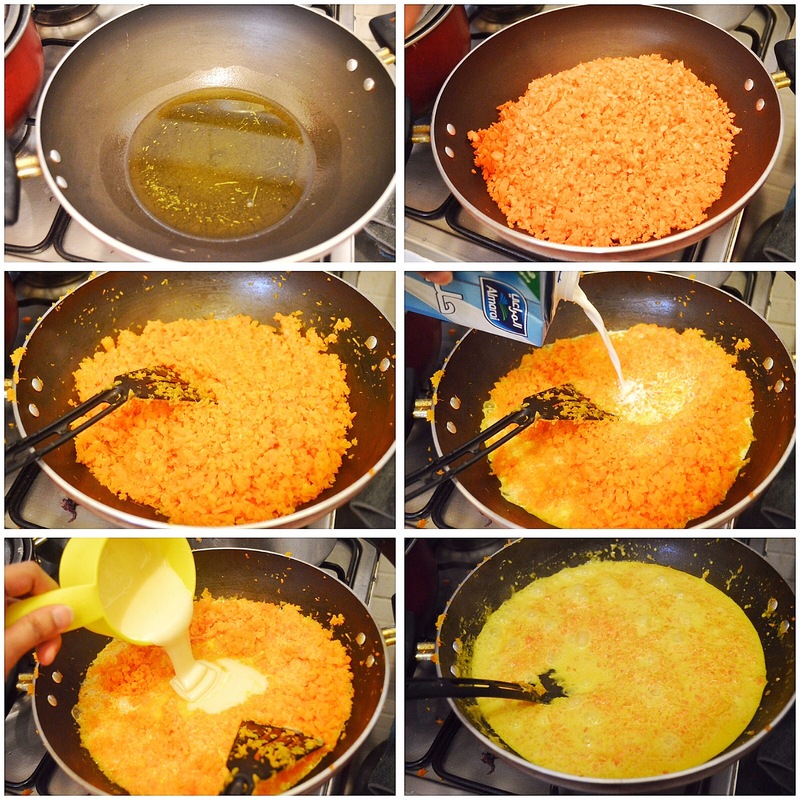 In a heavy bottom pan, add 3 tbsp ghee and cook the grated carrots in it for 10 minutes. Add the milk and condensed milk and cook on low flame for 45 minutes, stirring every 10 mins. Add in the nuts, sugar (if needed) and mawa. Cook for 10 more minutes on low flame. Add in 3 tbsp more ghee. In a pan add in the sugar and water. Let it come to a boil, stir for the sugar to dissolve. Reduce heat to low and let it simmer for 5 minutes till the syrup turns very thick. Switch off flame and add saffron and rose water. Cover with lid and keep aside. 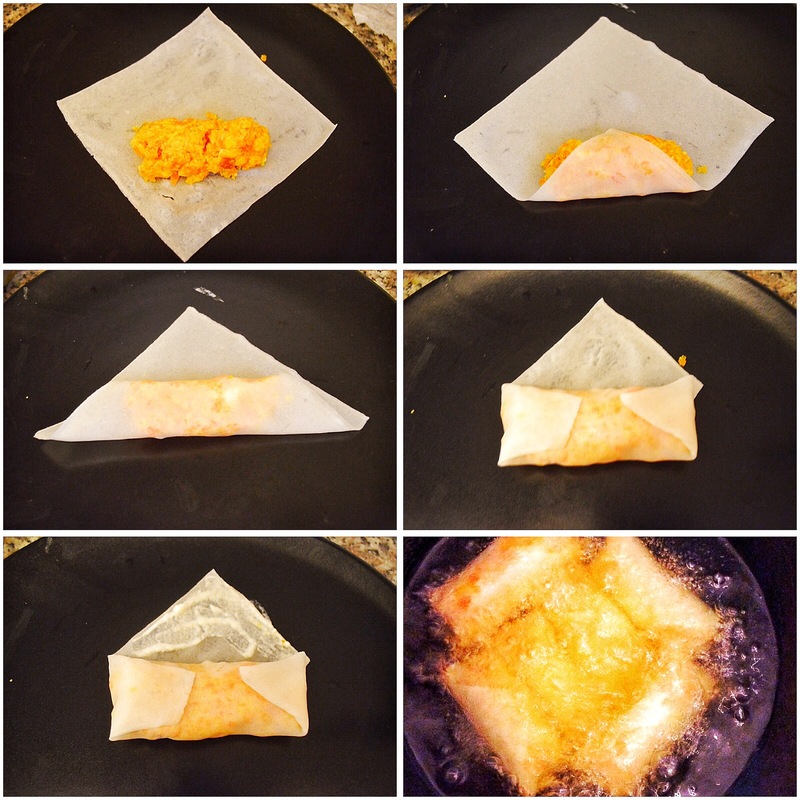 Fill the spring roll pastry as shown in the pictorial and seal the ends with the prepared slurry. Pour lots of sugar syrup on the spring roll, such that the entire roll is covered lavishly with it. 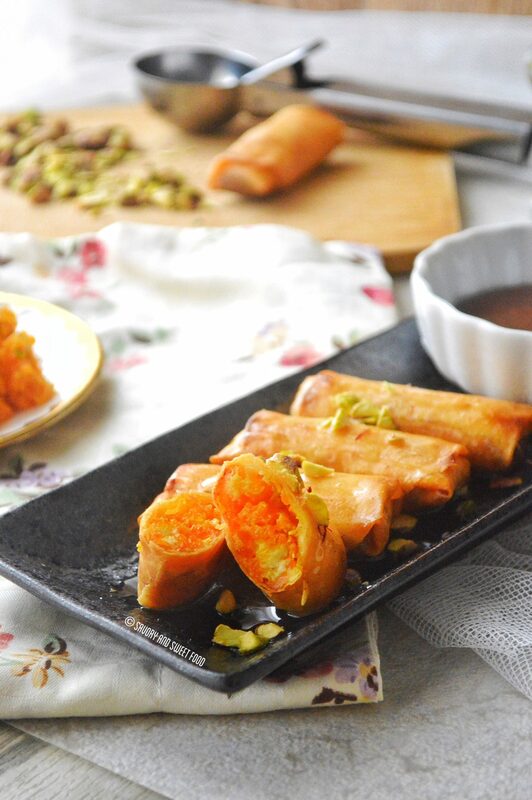 A melt in your mouth carrot halwa which is packed into spring roll pastry, deep fried and drenched in sugar syrup. * As i was too lazy to grate the carrots, i chopped mine really fine in the food processor and it came out really good. 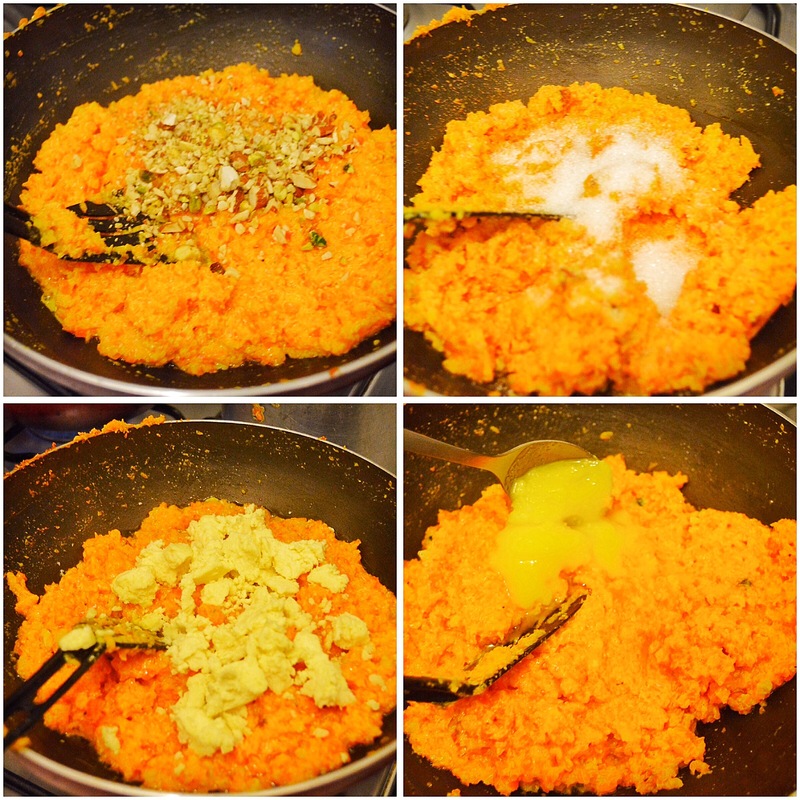 * If you don’t want to cook for so long and need a faster gajar halwa, reduce the amount of milk to about half a cup. But i highly recommend long slow cooking. * You can omit the condensed milk amd just add sugar. * Drench the spring roll completely in sugar syrup. Stunned by the appetizing photos and even more by the imagination and the idea behind the recipe. Marvellous!!! 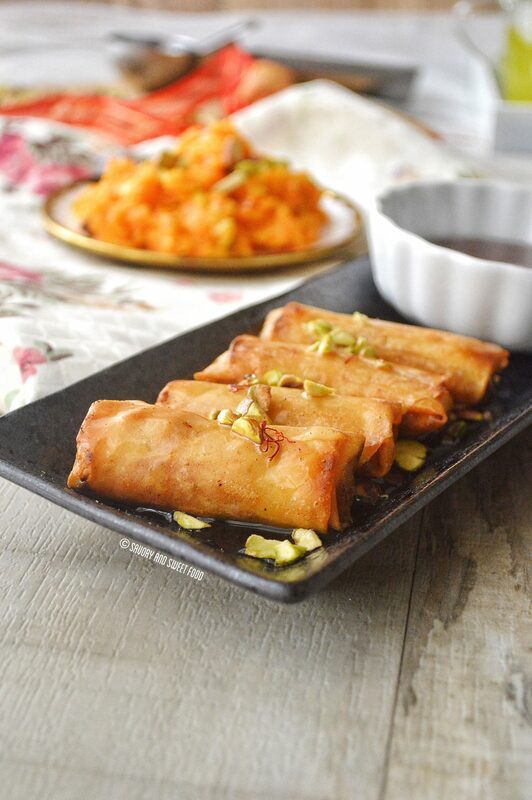 Incredible!Woow let me imagine that crispy spring roll pastry in sugar syrup and the surprize inside!Its just awesome Sadia!Really love your ideas! Masha Allah! Don’t know what impresses me more… the appetizing photos or the idea behind this fusion recipe. Simply out of words!!! I guess I will borrow your shawarma filo pastry idea and bake the rolls to enjoy this one without adding more to my already burgeoning waist line.